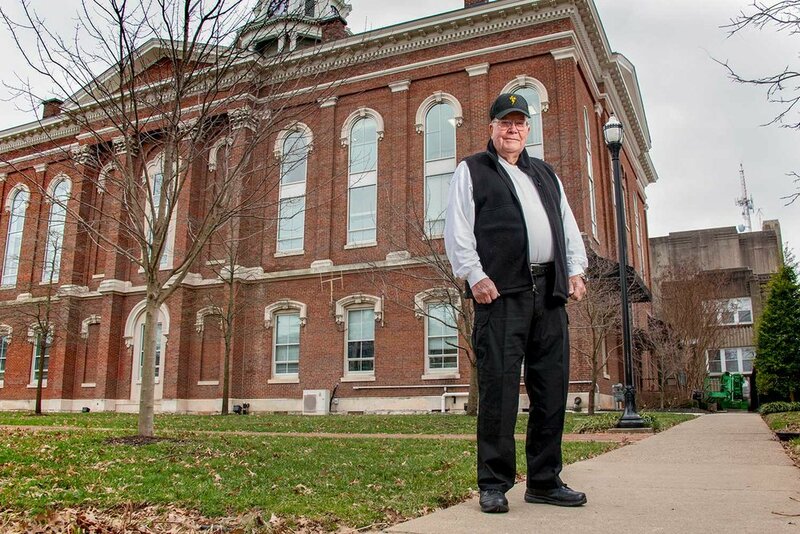 Serving Warren County for about 40 years, one of the longest careers to date for any Kentucky sheriff, has been no circus to Jerry “Peanuts” Gaines. Instead, he looks back on his time as a dedication to the community that made its mark on him during his long career. Gaines, known throughout the state simply as “Peanuts,” says he obtained the nickname from his father. As a boy, his father worked for a Greek restaurateur who saw him eating peanuts one day and dubbed him with the name. “I had an older brother who came along, and he never was a little peanut. But when I came along, I was a little peanut,” explaining how he inherited the moniker. When he was about 10 years old, Gaines met a Warren County sheriff who was out campaigning. The man was driving a 46-47 Chevrolet car. Gaines’ father told him that the man in the big hat was the sheriff and that he had held multiple elected offices throughout his career. “That got me interested in (politics and law enforcement),” said Gaines. In his mid-20s, Peanuts ran for magistrate but lost. Over the next four years, Gaines said he registered 1,000 people, and the next time, he took home the victory. “That got me started,” he said. Then, he met and married his wife Marilyn, of 45 years, and moved out of his district. However, after some urging, Gaines decided to toss his hat into the ring for sheriff, after finishing his term as magistrate. Once again, Gaines lost his election. Falling back on tactics that led to him to the magistrates’ office, Gaines began registering voters. “The next time I won by a landslide,” he said, of his 1977 win. Four years after completing that term, Gaines sat out a term, and then retook office in 1986. There he remained until 2018. “It gets in your blood,” said Gaines of the job, and rightly, it was. Gaines’ father had served as a deputy years before. “I just, kind of, picked it up. When you’re interested in something, you, kind of, have more of a keen eye for it,” he continued. Looking around at the Warren County Sheriff’s Office in 2019, Gaines said there has been a lot of change. When he first entered the office, only eight deputies, two government workers, one full-time dispatcher, a bookkeeper and one employee for car inspections staffed the department. “We had to furnish our own cars…the county judge would give you two sets of tires a year to go on your car,” said Gaines. At Gaines’ retirement, he said the department had more than 100 employees. The long-time law enforcement officer said he never once questioned his chosen profession. For Gaines, a long career meant a long list of accomplishments. Among them, being named president of the National Sheriff’s Association, president of Kentucky Association of Counties, five terms as the Kentucky Sheriff’s Association president and, in 2010, being named the National Sheriff of the Year. “If you find something you enjoy doing, it makes it a whole lot easier,” he explained. “It wasn’t pushed on me. I wanted it…I was here. This was mine. Those 127,000 people out there belonged to me, and I looked after them. Recently, the Warren County native said he walked up the sidewalk near the courthouse, and it dawned on him, he isn’t sheriff anymore. With 40 years of service to his name, Gaines said it might be time to take one.